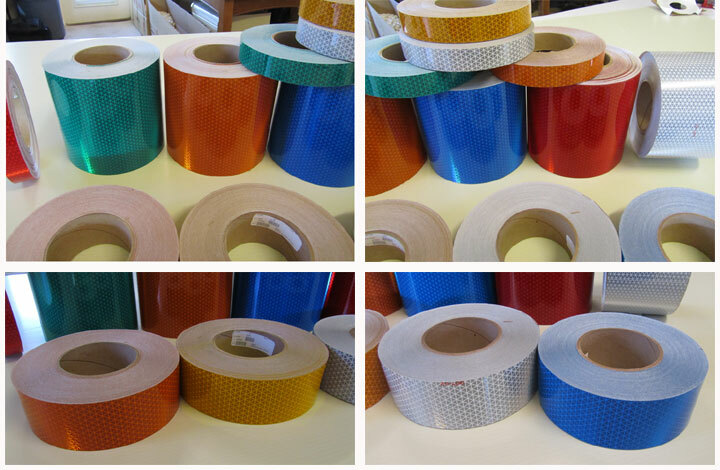 Engineer Grade is the most popular of all the reflective tapes due to its versatility. It can be CAD cut with a standard vinyl cutter or it can be slit into rolls and used for vehicle striping. It is flexible and will conform to uneven surfaces. When warm it becomes pliable much like black electrical tape. It has a 7 year outdoor life and also comes in the largest number of colors. The image and chart below show the reflectivity intensities of our Flexible Engineer Grade Tape. The values shown below are average typical values using standard entrance and observation angles. 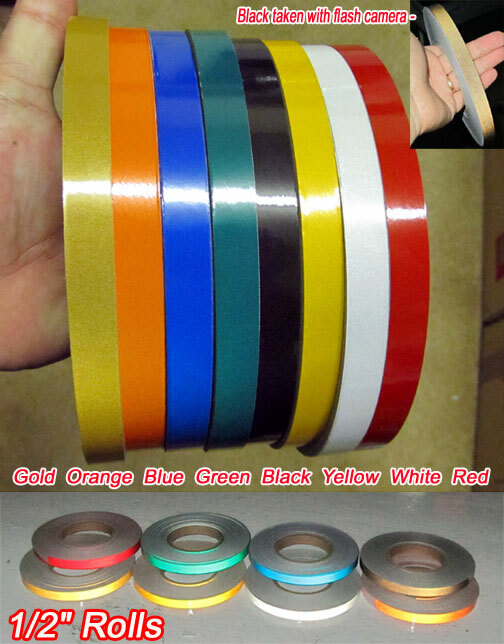 High Intensity Type 3 tape is available in 6 colors. Orange, White, Blue, Green, Yellow and Red. We carry several widths such as 1″, 2″, 3″, 4″, 6″, and 8″. We can custom cut rolls when needed. The picture below shows all the colors in natural light. The picture below shows the tape when photographed with a flash. 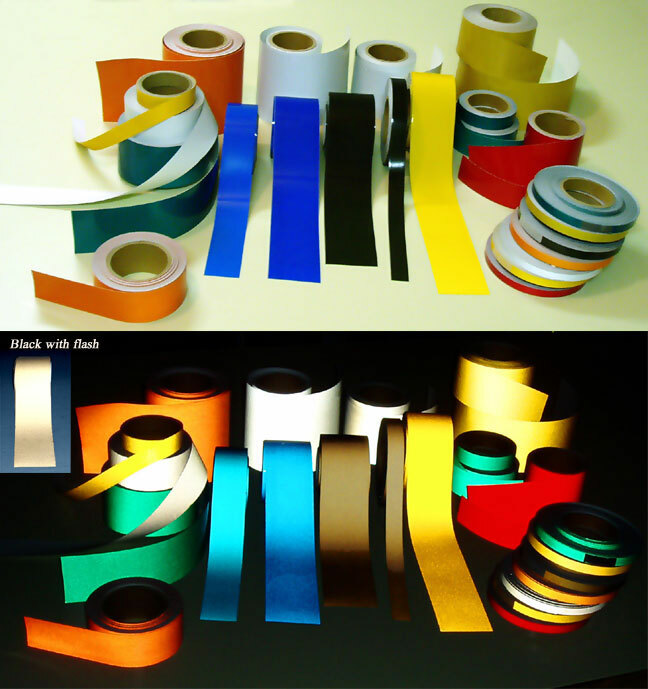 High Intensity Type 3 tape is about 3 – 4 times brighter than standard engineer grade films. This makes it much more visible over distance and close up. This type of tape is commonly seen on traffic cones, road barrels, work zone equipment, object markers, and brighter road signs. Other uses are dumpsters, roll off containers, gates, fences, building corners, bollards and other applications where cars are close up when they need to see the tape. For applications where cars need to see the tape from a distance I would recommend stepping up to a prismatic tape. Chevron stripes on a fire truck are an example of this. 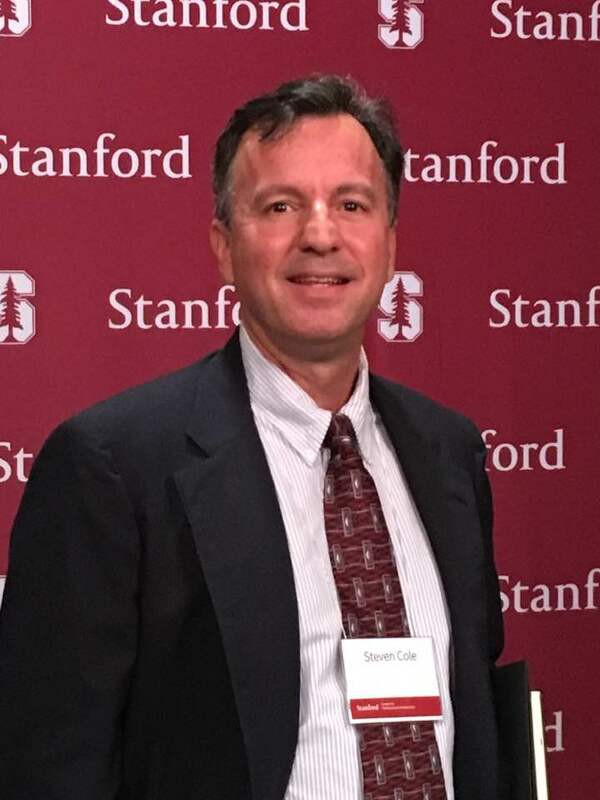 Because of its type 3 rating it is more widely approved by governmental agencies such as the Department of Transportation. When used for signage it is compliant for all signs except those that are overhead like the ones you see on interstates. It exceeds the requirements for all ground mounted signs. The chart below shows the reflectivity of the different colors at standard entrance and observation angles. As you can see, white is the brightest followed by yellow, orange, red, green and blue. For applications that you want to be extremely visible you can mix colors. For example, alternating yellow and red or white and red is very effective. Alternating colors have been shown to get peoples attention much more than single colors. The retroreflectivity of ULG sheeting meets or exceeds all retroreflective sheeting standards worldwide. Typical standards are listed in the tables below. Oralite’s V92 tape is a thin, flexible and bright reflective film. We carry white, red, orange, school bus yellow, blue and green. 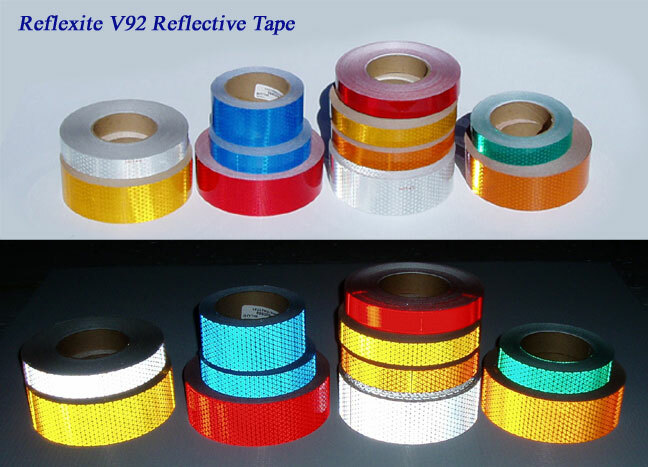 V92 tape reflects light using man made prisms which is why this class of tape is called prismatic reflective tape. It is comparable to a type 4 or 5 film. This material is very popular for fire truck and emergency vehicle applications. 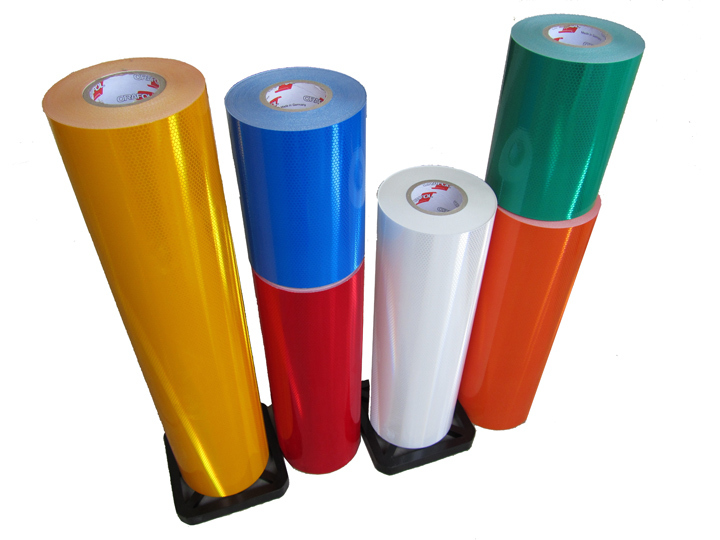 One unique feature of the Reflexite films is that they are made in a single layer and do not delaminate like other reflective tapes. Even after multiple impacts, the Reflexite film will still reflect whereas others come apart. Reflexite films also have an incredibly strong adhesive. Since the tape is thin it is able to wrap around a tighter radius like a PVC pipe. For example, many people wrap it around PVC pipes and use them as snow poles. The image below shows the tape in regular daylight and reflecting at night. The tapes reflect at the following intensities. Reflexite V92 Prismatic Tapes can be purchased at the following online stores. Oralite V82 is a 10 year prismatic tape that exceeds ASTM D4956 Type 5 standards. Because the tape is a “Typed Tape” it can be used for sign sheeting and would be MUTCD compliant for most applications. It is available in solid colors and also in alternating red and white. 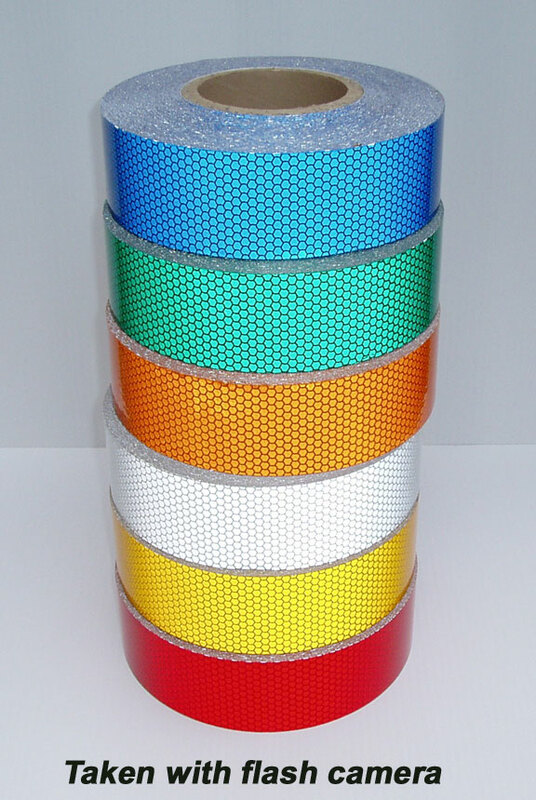 (DOT Tape) It is the brightest tape in the Oralite line. It is the colored equivalent of Oralite’s SOLAS tape. We carry standard yellow, schoolbus yellow, red, white/silver and two alternating red and white DOT tapes in the V82 line. We carry two yellows in the V82 line. The one above is a #18 yellow and the one below is the school bus yellow. The school bus yellow has more gold in it. The picture below also shows our V82 White/Silver which is the brightest of the V82 line. It would be the closest tape to SOLAS. The picture below shows our Red V82 tape. It is often used along with the #18 Yellow to create chevron striping on fire trucks and apparatus. The image above is of our 1″ red and white (silver) DOT tapes in the 6/6 or 7/11 pattern. We also carry 2″. V82 tape (red & yellow) can be purchased at www.reflects-light.com or at www.colebrothers.com. V82 DOT tape (white or red/white) can also be purchased at our main store in 1″ widths and 2″ widths in both white and alternating red/white.